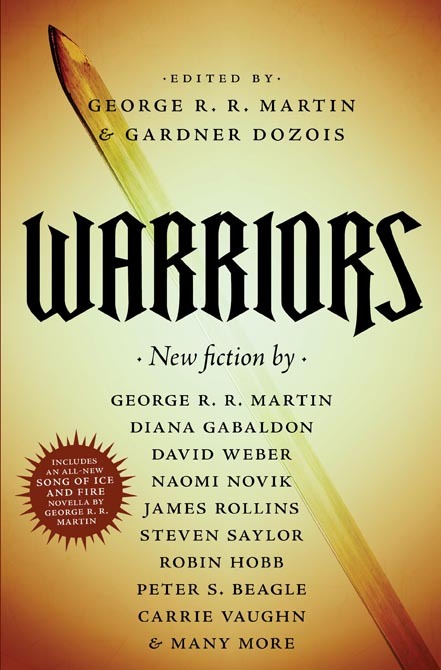 Having enjoyed the Warriors anthology edited by George R. R. Martin and Gardner Dozois (Canada, USA, Europe ) even more than I initially thought I would, I wanted to give the contributors the opportunity to introduce readers to the story they submitted. Alas, deadlines and commitments prevented many authors from doing so, but a few took some time off from their busy schedules to come up with the following introductions. - Robin Hobb, author of "The Triumph"
Years later, in the wonderful book Dragons; A Natural History by Karl P.N. Shuker, I read a section that included excerpts from Roman reports of a legion’s contact with a gigantic river serpent. I was instantly fascinated, and set out to track down more of the original reports. Both Pliny and Livy mention the incident. Roman military commanders often sent reports and military trophies back to the Roman senate. In this particular case, the commander, Marcus Atilius Regulus not only sent a report home from Carthage, but the skull and the hide of the creature, so that his account of the battle would not be doubted. Those trophies were evidently on display in the senate for years before a fire destroyed them. So, we had the word of a Roman commander, plus physical evidence seen by hundreds of Romans, to back up this tale. What was that beast? The commander had resorted to siege machines to batter it to death. Discovering what had become of Regulus was even more fascinating. He chose death before dishonor. No more of that will I say, lest I give too many spoilers to my story. I did, of course, add my own character and elements to the tale. But that is, of course, what writers do. I hope readers enjoy the story but are also curious enough to follow up on the historical roots of the tale. - Joe Lansdale, author of "Soldierin'"
When I was approached to write for Warriors, and was told I could do anything I wanted, and that since a lot of the writers were expected to do horror and science fiction and fantasy, and since I've done all manner of things, they wanted to know if I'd do something different. I love Westerns. I've written one, THE MAGIC WAGON, that has some fantasy elements, and a few horror Westerns, but I've been wanting to write a straight Western for some time, featuring a black cowboy in the Old West. I wanted to write a novel actually. I decided I would take elements of my novel idea, and see what I could do with it. I had already done a lot of research. I wanted to keep the tone of the era, and not modernize or make it politically correct, and I wanted to show that blacks did more than the Old West than cook meals, wait on tables, and shoe horses. And I wanted it to have a sense of humor. I loved it. I loved it so much I wrote another one about the character and it was published in an on-line magazine for Subterranean Press, guest edited by Gardner. I'm very excited about the opportunity, and hope to write more stories about the character, and at some point write a more detailed and more developed version as a novel. - Carrie Vaughn, author of "The Girls from Avenger"
I was a late addition to the anthology. George and Gardner asked me to fill in for a last-minute empty slot. The conversation went something like this: George said, "How quickly can you write a story for Warriors?" I said, "How quickly do you want it?" "Last week," he answered. Alrighty then! Initially, I had a story already written that I was going to submit, about a Conquistador in Mexico. Then I slept on it. Then I thought about the WASP. And I thought about how cool it would be to have a story in an anthology like this in which the main characters are all women. So instead of making it easy on myself and submitting the story I'd already written, I asked for the extra time to write one from scratch. I'm glad I did, and I'm glad George and Gardner gave me the time. The WASP, the Women Airforce Service Pilots, are one of my favorite unsung historical stories. (They're becoming increasingly better recognized, which is awesome. Just this week, the WASP were awarded the Congressional Gold Medal for their service.) Between 1942 and 1944, a group of over a thousand women flew airplanes for the Army Air Forces. They ferried planes from the factories to various bases across the country, towed targets for gunnery schools, tested recently repaired planes, and served as flight instructors. They flew every plane used by the Army Air Forces in World War II, including the B-29. "The Girls from Avenger" isn't a war story so much as a story that takes place during wartime. It's more of a murder mystery. While all the characters and the specific sequence of events are fictional, the death at the center of the story is based on the real crash that killed Cornelia Fort, the first American woman pilot to die in military service. Thirty-eight WASP in all died in the line of duty. I expect some people will argue about my definition of a "warrior" in this story, since no character faces any actual combat, and the WASP didn't participate in any official battles (unlike their Soviet counterparts, the Night Witches, who I am definitely going to write about someday). But they put their lives on the line for the war effort, and they did battle against a lot of prejudices for the privilege of doing so. They're way high up on my list of personal heroes. - Cecelia Holland, author of "The King of Norway"
The story I have in Warriors, "The King of Norway", was already mostly written when George and Gardner asked me to contribute. I had been writing a long series of books about vikings, starting with Eric Bloodaxe and ending with Canute the Great. Starting the fourth book I wanted to include the great battle of Hjorunga Bay, but could not launch the book from it: too far from the meat of the book, I found. But I still had about 7500 words on it and so was glad when George and Gardner proposed this anthology. Hjorunga Bay was an actual battle in the early 990's in Norway and there is some excellent primary source material on it--the saga of the Jomsvikings, and Heimskringla, for instance, plus local legends and weird stories. Most of this material was written down centuries after the fact and is highly speculative but there is extensive cross-referencing which gives it a beguiling resonance--the hailstorm is mentioned in several places, for instance, and there's the odd name of the island, Primesign, which implies to me when the christians finally won the country they had to do some special cleansing of this particular place. The frost giants lived on for a long time in the trond. I was interested in how vikings fought ship to ship battles, about which the material gives tantalizing glimpses, and that drove the story. I had run into Erik Hakonsson' iron-clad ship in Heimskringla, where it shows up at the battle of Svolder about ten years later, and had had many a spirited discussion with ship-knowing friends about how all this iron would affect the ship's handling, etc. The Jomsviking saga provided a nifty ending which delighted both my sense of the warrior ethos and my fondness for the sagas as a whole. I wanted more than anything to show how beautiful and passionate and self-destructive this way of life was, and whether the beauty and the honor are worth the price. 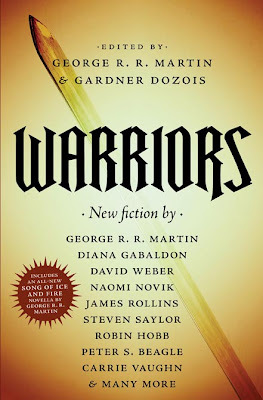 So I did a little work on the 7500 words I had and sent the story in, and now there it is, in the Warriors' vanguard. I've been reading through the anthology piece by piece, generally starting with the shortest works after I got the more familiar writers or anticipated stories out of the way. Excellent work all around, so far. I just read Lansdale's story last night, in fact. My first contact with his work, and it was a fun adventure, with a great narrative voice. I'll be keeping an eye out for a novel drawing from the same well. I found Tad William's "And Ministers of Grace" to be one of my favorites so far (I'm less than halfway done the anthology). It not only provided an action-packed story with an intriguing character, but it did what really good sci-fi does: it made me think profoundly about the society I live in. I am almost finished, there are just a couple I haven't read but the Peter Beagle story blew me away as did the Robin Hobb one. I wonder if the rest of the books written by Robin Hobb are as good as this short story? Dear lord valerie! Don't tell me you haven't read the farseer trilogy, the liveship traders trilogy, the tawny man trilogy?!? 9 of the best books you will read, seriously i cannot praise them enough. @Valerie, seriously just go the library and start with Assassin's Apprentice by Robin Hobb. You will be hooked by the end of the page!